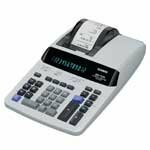 The Sharp EL-2630 printing calculator is an indispensable tool for both home and office. The EL-2630 displays an extra-large 12-digit LCD display for better viewing, and two-color ribbon printing (positive numbers in black, negative numbers in red) is enabled at about 4.8 lines per second on standard paper rolls. 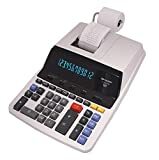 The EL-2630 has four-key memory (memory plus, memory minus, and recall/clear) and special functions keys including grand total, adding mode, constant, double zero key, mark-up/profit-margin key, item counter, and rounding settings. Decimal settings are adjustable from floating to fixed decimal places (6-3-2-1-0). A calendar/clock function displays and prints the date and time. 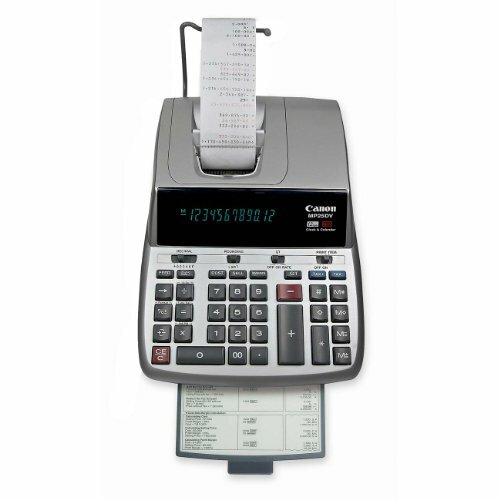 Canon's heavy-duty MP25D desktop printing calculator is an indispensable tool for demanding offices, providing a range of functions for quick math calculations and figuring finances. You have two ways to review your calculations--the large display or the two-color printout. 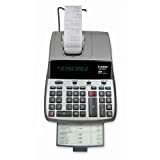 A 12-character display and special function keys will also increase your accuracy. 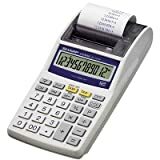 The MP25D's function keys include markup/markdown, delta percent, grand total, multiple decimal point positions, item count, and non-add print. The numeral keys are large and easy to read, and you can keep running totals as you enter data. Use the rounding function to automatically round your results up, down, or off by a specified number of digits. 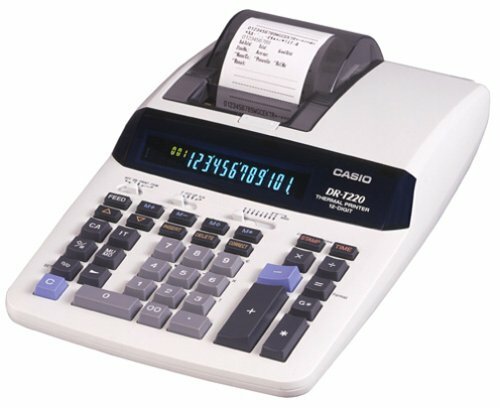 Calculate taxes with a prestored tax rate. 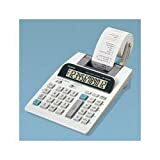 The MP25D provides all the basics of calculation: addition, subtraction, multiplication, division, constant multiplication, division and percentage calculations, percentage add-on, and discount calculations. 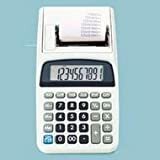 If you are familiar with this type of calculator and its funtions then it might be a good calculator to have. But, if you are not, then good luck figuring out how to use it. Setting the date and time is easy once you figure out the cryptic and 100% worthless manual. There are keys on it that I have absolutely no idea of what they are for. No picture of the key layout and what each keys function is. 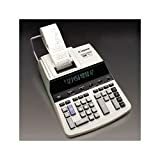 Yes, one that is familiar with this type of calculator may not have any problems but not all people are and there are those who would like to learn to use it properly. The examples in the manual are bad. I went to the Canon web page and found absolutely no help there. The Sharp EL-1197P drum printing calculator is an indispensable tool forheavy offices uses. 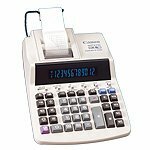 The EL-1197P has a large 10-digit blue fluorescent display and prints characters in black at 3 lines per second on standard paper rolls. One color printing, prints 0.9 lines per second. 10 digit display has independent memory. Ac adaptor included but also runs on EVEE91BP4 replacement batteries. Replacement paper CEB20212, replacement ink roller NUKNR12. Prints 1.4 lines per second. 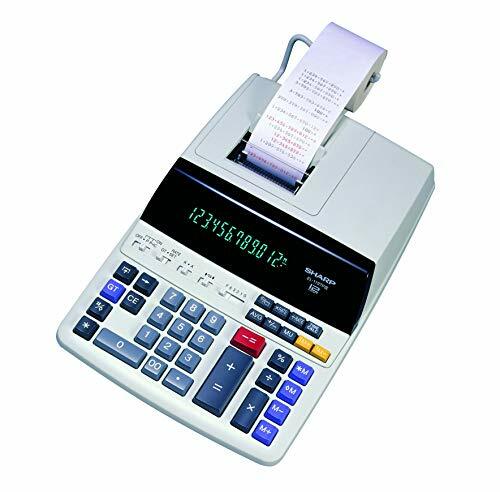 Twelve-Digit, heavy-duty two-color desktop ribbon calculator printer. Also features a high-speed (3.6 lps) quiet ribbon printer. Item count, tax keys, markup (MU) key, floating point or fixed decimal key, grand total (GT) key. Portable handheld calculator with large display and compact keyboard layout.